Image To ZX Spec 1.4 has now been released. Huge improvements to GigaScreen (102 colour) image quality. SCR Gigascreen export image order by Hue/Saturation/Brightness. Added new GigaScreen BASIC ZX Spectrum image loader. Usability improvements and toolbar added to UI. Image quality improvements for prefer detail setting. Accuracy and speed improvements for image pre-processing. Updated VLC4J to allow the video conversion from VLC 2.1.3. Image to ZX Spec 1.4 distribution (direct download, just unzip and double click jar file to start). 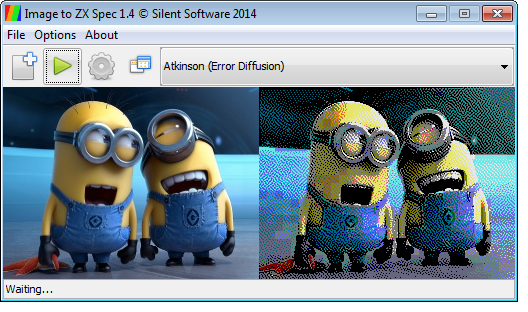 "Could not find the main class: uk.co.silentsoftware.ui.ImageToZxSpec. What operating system are you using? Did you double click the file Img2ZXSpec.jar? Image To ZX Spec requires Java 7 as a bare minimum, it could be you're using an old (and possibly misconfigured version) of Java - perhaps try reinstalling it from https://www.java.com/en/download/ ? The error you're seeing shouldn't occur as it suggests that an internal file inside the jar you've double clicked doesn't exist. I've just verified the download again and can confirm the jar file does run. I updated Java and now the software is running nicely. It seems that on OS X 10.9.5 the program doesn't produce any output (tried both, Java 7 and Java 8). I see window, I'm able to choose photos/videos but even for photos 256x192 it doesn't save the result (tried .tap, .gif or simple jpg/png - nothing produced). How can I enable logging for this one? but is that a JAR problem, or Im2Sp ? I haven't tested with Java 8 but the app doiesn't need the policy tool so I think that may be a Java config problem. This is an awesome program BUT it wont save any files to my computer, ive clicked every possible variable and tried setting the output folder to lots of diferent things in different place, the files process on the screen but no files are saved, please help, is it becuase I have Java 8? should i try and go back to Java7? I've not tested it on Java 8 but I don't see why it wouldn't work, just make sure that you've ticked some file output settings, have enough disk space, have the correct user permissions to write to the folders you have chosen, and that you aren't running the app in a sandbox (e.g. some antivirus may prevent saving files). Thanks for the tips, I tried all that but still no output files, Java site says contact developer instead of rollling back the Java version.. I'll be upgrading the app today to use Java 8, if I can replicate the problem I'll try and get an update out sometime in the next week. same problem as teddy, is there a way to make it work yet? any possible thing i forgot to click? I've replicated the problem on OSX. With any luck/time a new build will be up within a fortnight. Thanks for the feedback! The bug is caused by an issue with Java's file selector on MacOS, specifically the output directory you choose is not provided correctly (without going into minutiae here). The workaround is to choose an output directory by selecting the folder with a single click instead of double clicking the folder (which would have drilled down into it). The latest build I have has resolved this bug but it's not ready for release just yet due to ongoing improvements in other areas - I'm hoping to keep the same timescale I quoted earlier but no promises!